This DVD introduces you to the best birdwatching sites in northern Goa and gives you a real ‘feel’ for what it’s like to go there. Join British birder, Dave Gosney, on his visit to Goa in search of fabulous birds such as Indian Pitta, Malabar Trogon, Sri Lankan Frogmouth, White-rumped Shama, Racket-tailed Drongo, Oriental Dwarf Kingfisher and many more. You’ll see footage of all the most exciting species, you’ll get an idea of what each of the sites is like... and we think you’ll also have a laugh or two as the story unfolds. Special bonus feature: a gallery of terrific photos taken in Goa by Terry Spooner. 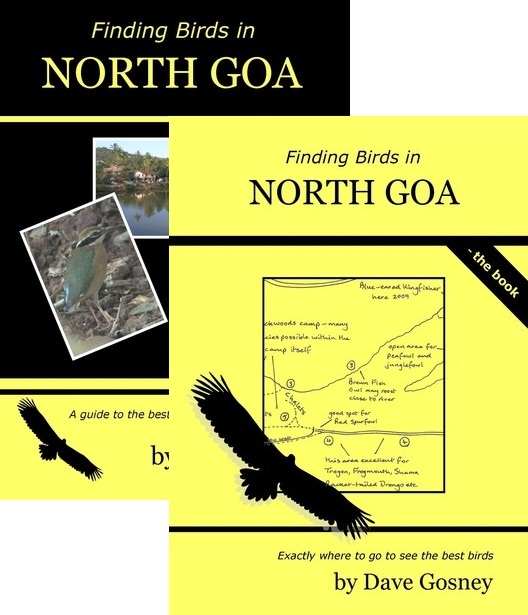 This book will tell you all you need to know about exactly where and how to find the best birds of north Goa - that’s the area north of the Zuari river that most birdwatchers concentrate on. ‘It’s now over 14 years since Peter Harris published his ‘Independant Birder’s Guide to Goa’ and much has changed since then. In particular there has been an explosion of information available on trip reports on the internet but you could literally spend days going through this material , trying to make sense of it all. I’ve therefore written this guide, based mostly on my visits in 2008 and 2009, which updates this information and puts it all in one place, in a format you can easily take with you’.